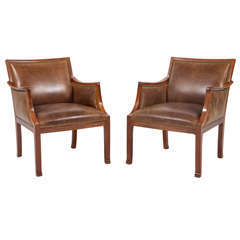 Frits Henningsen, pair of Cuban mahogany armchairs with curved armrests and legs. Sides, seat and back upholstered with patinated original black leather, fitted with brass nails. Back with leather covered buttons. Designed 1932. Made by cabinetmaker Frits Henningsen. Literature: N. Oda, Danish Chairs, San Francisco, 1996, p. 42. 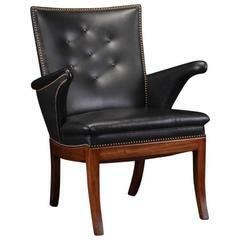 A rare easy chair of leather and mahogany with nailhead trim. Designed by Frits Henningsen (1900-1970). 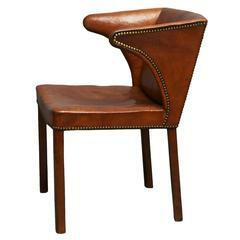 Frits Henningsen armchair. Frame of solid Cuba mahogany. Back with cane. Seat later upholstered with light wool. Designed in the 1930s, made by Frits Henningsen. 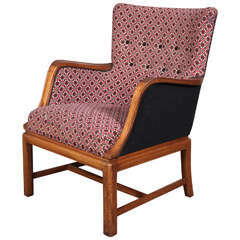 Frits Henningsen easy chair with mahogany frame in fabric.